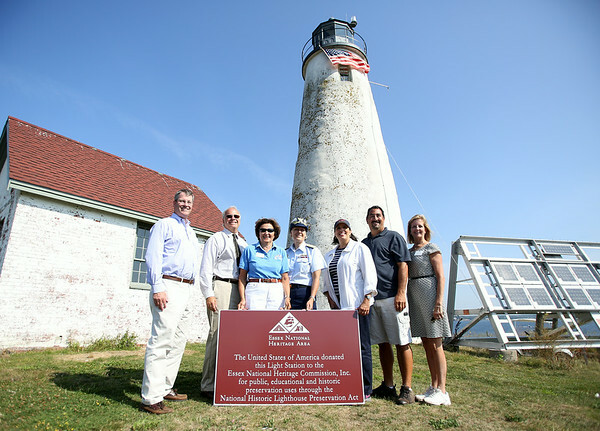 From left: Vice President of Essex National Heritage Commission and Senior Vice President and Director of Managed Assets of Eastern Bank, John Farmer, General Services Administration Regional Commissioner Glenn Rotondo, CEO of Essex National Heritage Commission, Annie Harris, Rear Admiral Linda Fagan, of the United States Coast Guard, Mayor of Salem Kim Driscoll, President and State Senator Joan Lovely, pose for a photograph in front of the lighthouse on Bakers Island following a deed transfer for part of the Island from the US Coast Guard to the Essex National Heritage Commission on Wednesday morning. DAVID LE/Staff photo. 8/27/14.